"Cain and Hopkins’ British Imperialism reinvigorated the debate about the ‘Expansion of England’ over twenty years ago, and today its argument is as ambitious, intriguing, and provocative as ever. A triumph of scholarly synthesis that spans centuries and continents, it remains one of the truly indispensable texts for understanding the origins of empire." "British Imperialism still stands as expansive imperial history at its best: simultaneously methodical yet bold, detailed yet clear, its main arguments sparkle with a subversive revisionism that makes it fully deserving of its continuing position as essential reading on Britain’s global relationships in the modern age." 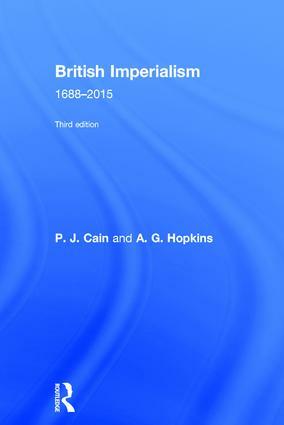 "The work of Cain and Hopkins is essential for understanding the scope and strength of the British Empire. While no one frame of analysis is sufficient to encompass the full complexity of the British Empire, finance capital was critical to its influence, expansion, and power relative to other contemporary states and empires. No work explains the scope of British financial power or its role in determining global relationships in the modern period better than British Imperialism." "A magisterial account of 300 years of British history, properly putting the empire right at the centre." "A stunning mixture of narrative, analysis and brillian historiographical deconstruction." "As erudite as it is stimulating." "Essential reading for anyone working in the City." Foreword: The Continuing Debate on Empire. Part 1. 1. Introduction: 1688-1914. 1. The Problem and Context 2. Prospective: Aristocracy, Finance and Empire, 1688-1850 Part 2. The Gentlemanly Order: 1850-1914.. 3. ‘Something Peculiar to England’: The Service Sector, Wealth and Power, 1850-1914 4. Gentlmanly Capitalism and Economic Policy: City, Government and the ‘National Interest’, 1850-1914 5. ‘The Great Emporium’: Foreign Trade and Invisible Earnings, 1850-1914 6. Two Nations? Foreign Investment and the Domestic Economy. 1850-1914 7. Challenging Cosmopolitanism: The Tariff Problem and Imperial Unity, 1880-1914 Part 3. The Wider World: 1850-1914. 8. ‘An Extension of the Old Society’: Britain and the Colonies of Settlement, 1850-1914 9. Calling the New World into Existence: South America, 1815-1914 10. ‘Meeting her Obligations to her English Creditors’: India, 1858-1914 11. ‘The Imperious and Irresistable Necessity’: Britain and the Partition of Africa, 1882-1902 12. ‘We Offer Ourselves as Supporters’: The Ottoman Empire and Persia, 1838-1914 13. ‘Maintaining the Credit-Worthiness of the Chinese Governmant’: China, 1839-1911 Part 4. Redividing the World. 14. Britain, Germany and ‘Imperialist’ War, 1900-1914 15. Retrospect: 1688-1914 Part 5. The Empire in the Twentieth Century 16. The Imperialist Dynamic: From World War I to Decolonisation Part 6. The Gentlemanly Order, 1914-39. 17. ‘The Power of Constant Renewal’: Services, Finance and the Gentlemanly Elite, 1914-39 18. Industry, the City and the Decline of the International Economy, 1914-39 19. Upholding Gentlemanly Values: The American Challenge, 1914-31 20. ‘A Latter-Day Expression of Finanial Imperialism’: TheOrigins of the Sterling Area, 1931-39 Part 7. The Wider World, 1914-49 21. Maintaining Financial Discipline: The Dominions, 1914-39 22. ‘A New Era of Colonial Ambitions’: South America, 1914-39 23. ‘Financial Stability and Good Government’: India, 1914-47 24. ‘Playing the Game’ in Tropical Africa, 1914-40 25. ‘The only Great Undeveloped Market in the World’: China, 1911-49 Part 8. Losing an Empire and Finding a Role, 1939-2000 26. The City, the Sterling Area and Decolonisation 27. Conclusion: 1688-2000 Afterword:Empires and Globalization. Maps. Further Reading. Index. P.J. Cain is Emeritus Research Professor of History, Sheffield Hallam University. A.G. Hopkins is Emeritus Smuts Professor of Commonwealth History, University of Cambridge and an Emeritus Fellow of Pembroke College.